Irene set up Still Mountain, a ranch on the outskirts of Sheffield over many years with her Amish husband, Chris. They imported ‘cowboy’ horses from the USA and lived an Amish lifestyle, off grid, in their log cabin surrounded by wildlife. When Chris died of cancer three years ago, Irene was left alone, getting older, almost deaf and with no one to help her run the place. Her husband had managed most of her affairs in their very traditional marriage. She had no idea about the general running of things. The cost of maintaining the land and horses is huge and she is sinking further into trouble trying to survive and keep all the horses alive. Today, Still Mountain is no longer a viable business and has fallen into disrepair. Luckily for Irene, a neighbour Alison, a retired university researcher, has been trying to help Irene find ways of making Still Mountain viable again. She has stabled her own horse on Irene’s land and is helping to maintain the place since Chris died. But there is way too much work for the two of them and nowhere near enough income to adequately look after the horses, some of whom are getting old and sick. So several months ago, sinking under the weight of it all, Alison placed an ad for help. Steven is an ex cocaine addict from Newcastle with an extremely troubled past. Newly released from his latest stint in prison and in a perilous state, he was admitted to Phoenix House, a rehab centre in Sheffield. He has undergone an intense program of recovery. A friend told him about Alison’s ad in a pet shop that was looking for volunteers to help out at Still Mountain. Having always loved horses, Steven responded and Alison arranged for him to come and help. Steven quickly fell in love with the place and now comes every day. His connection with the horses is incredible. There is an unmistakable bond between them, a natural affinity. In addition to this, a close friendship triangle and deep dependency has evolved between Steven, Alison and Irene. Steven hasn’t used drugs in over 18 months now and he swears the horses and Still Mountain have saved his life. He says for once he has a purpose, is needed and appreciated. He is relishing the opportunity to give back and help others after the chaos, sorrow and destruction he has created in the past. As well as Steven, other recovering addicts from Phoenix House signed up to volunteer at the ranch, coming once or twice a week. A few months ago, Alison discovered a horseman named Joe who trained in the America. He devotes his life to teaching both human and horse to develop a partnership. Joe visits Still Mountain weekly. Over the next few months he is planning to train Steven to ride ‘western’ and take part in competitions. Steven is currently doing the groundwork, using a technique called ‘The Feel’ building up to his first riding lesson. But this comes at a cost, so they are looking at ways to fund Steven’s training. All of this is now in jeopardy. Still Mountain is in serious danger of being shut down due to the surrounding neighbours petitioning Sheffield City Council to get Irene off the land. They see the ranch and it’s motley crew as a blot on the landscape. There are huge class issues at play here. So the Still Mountain community is now fighting hard to try and save Irene’s home, horses and the very essence of Steven’s world, the key to his continued recovery and healing. If the council closes the ranch, Irene will be made homeless and ten old, but much loved horses will have to be put down. This is having a huge impact on Irene’s mental health and she says that she often thinks of suicide. The only thing keeping her going are her horses and her new found community with Steven and Alison. During the coming months we will see if the fight with the council is successful. What will become of Irene and Steven if they close Still Mountain down? They must do all they can to raise the stakes for the place, bringing in as much new business as they can. They have all kinds of creative plans for the place. This has to succeed. Their very lives depend upon it. Still Mountain will be Directed by Debbie Howard, Produced by Colin Pons. 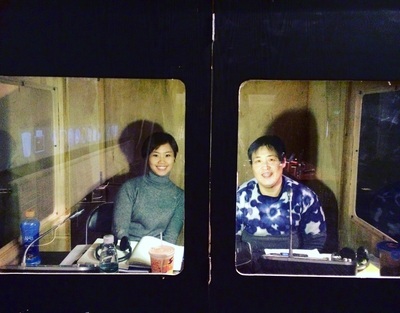 It is a co production between Big Buddha Films, Studio of the North and Sheffield Hallam University. Our new mid length, upbeat documentary, Absent From Our Own Wedding, goes into production in a couple of weeks. The film will be Directed and Produced by Debbie Howard, Exec Produced by Gillian Mosley of MediaLab UK and Commissioned and Exec Produced by Adam Gee at Little Dot for the Real Stories Digital Platform. 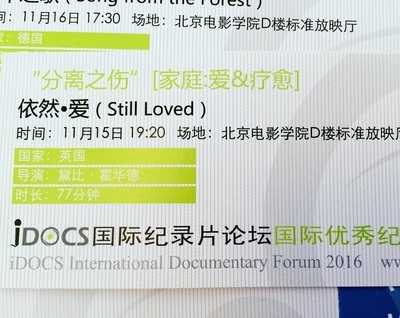 Still Loved was invited to screen at i Docs International Documentary Forum in Beijing, China on Tuesday 15th November 2016 by festival Director Cherelle Zheng. It was with enormous excitement that I travelled to China on 13th November, leaving straight from Cork Film Festival in Ireland where Still Loved had screened the night before. 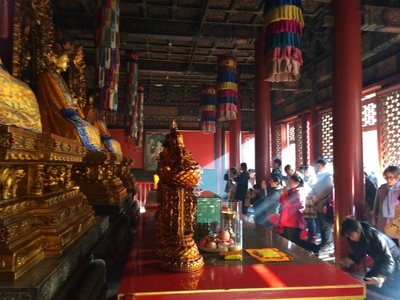 After a long flight I was greeted at the airport by one of the volunteers from the festival and taken to the hotel in a traditional hotong of old style Beijing. 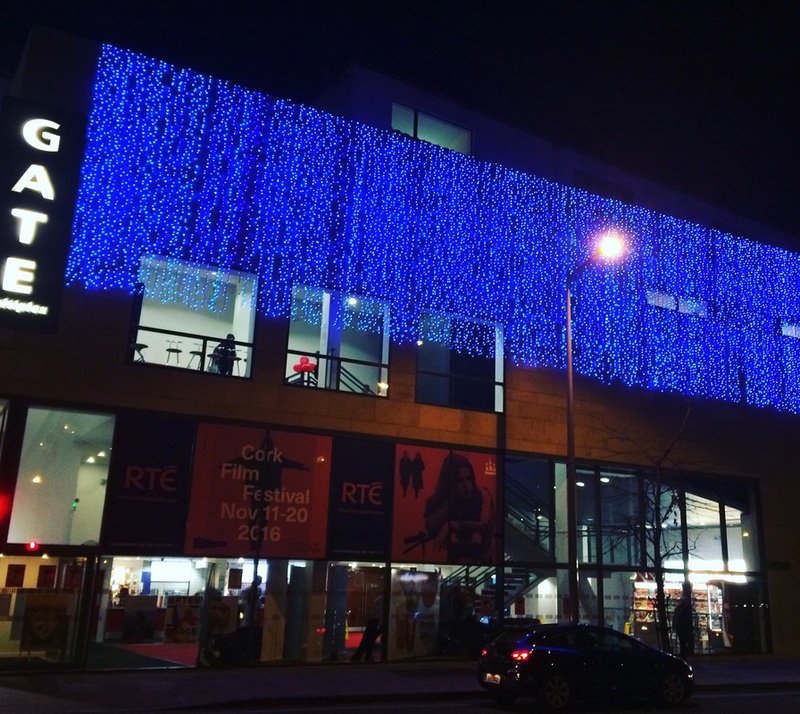 I had already missed the first few days of the festival, due to the screening in Cork Film Festival, and was jet lagged and exhausted on arrival. After a quick nap I met up with one of the other filmmakers who was in the hotel, Karen Guthrie Who’s film The Closer We Get was screening that night. 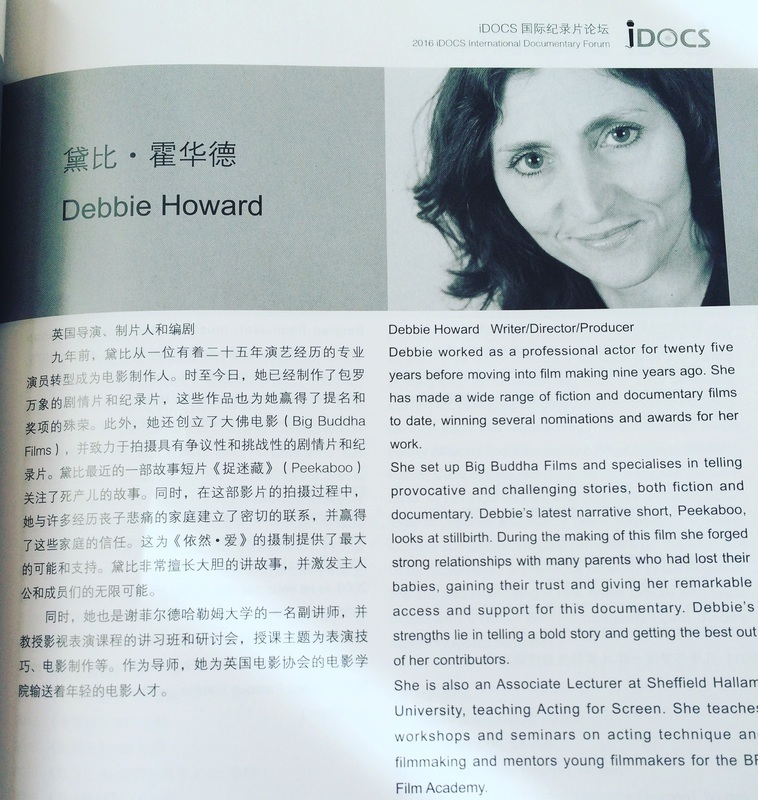 It was great to meet Karen and she escorted me down to the Beijing Film Academy to meet the team and all the other film makers from around the world. A beautiful banquet had been arranged for everyone at a nearby restaurant. What an incredible first night treat this was, with exceptional food and great company. After that I went to see The Closer We Get, a moving, beautiful film about her family secret that was both funny and sad and wonderful.The following night was the screening of Still Loved. Nothing could have prepared me for this experience. 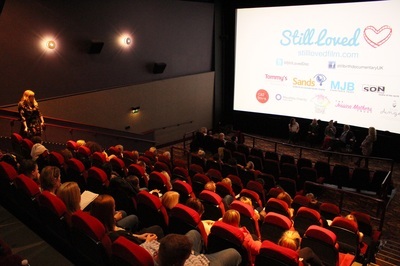 Over 1000 people turned up to see Still Loved, crowded into the packed cinema, it was quite an experience! Watching the film subtitled into Mandarin and listening to the reaction of such a large audience was very moving. The Q&A afterwards was an experience I will never forget. A Q&A with so many people is quite complicated, especially with a translator and language issues. This lasted about 15 minutes because the next day was a much more in depth discussion about the film in a two hour masterclass. After the screening, several people waiting behind for me to sign their tickets as memorabilia. The following day the masterclass I gave was hosted by Melanie Ansley Of China Hollywood. 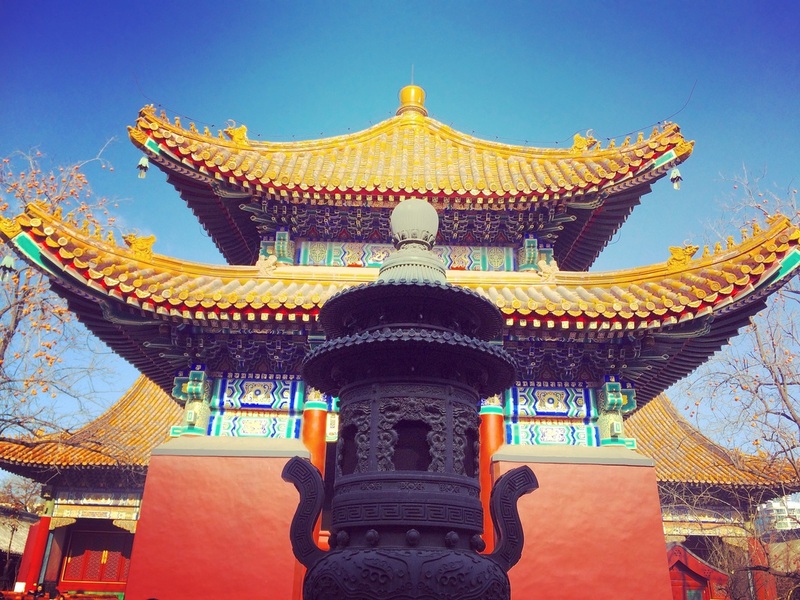 A filmmaker from LA that works in both the US and China. 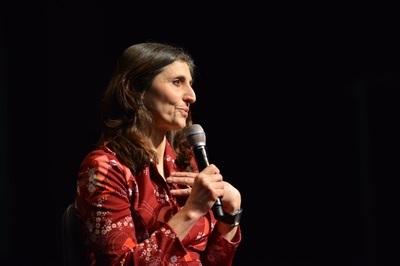 This was an extensive discussion about the making of the film and gave hundreds of people the opportunity to ask more in depth questions, again via two translators and also Melanie was able to clear up any misunderstandings that were still confusing. ​Still Loved was very well received, but it was very interesting screening to this audience with such a difficult cultural frame of reference. Some people had said how much they had cried in the film, others were very angry and others confused. For a culture that until recently had a one child only policy, termination is common here and especially the termination of girls. So I was told that they don’t really bond with the baby until it is born, and that a baby that has died would not be considered a human being. So it must have been quite hard for them to understand the feelings of the families in the film. This was not the case for everyone though. Some people were clearly very moved and it maybe brought up feelings about their own terminations that they had chosen not to give much thought to until now. Many people stayed behind to ask personal questions after the masterclass had finished. Someone told me her friend had recently had a stillbirth and asked how best to support her. There were many personal questions and I could see that for some the film had really moved them, and for others they were angry, but this was also useful I thought because it had opened up a debate and started a thought process, which is always the beginning of change. We had an expression of interest from a Chinese documentary distributor who is very interested in buying the film for a Chinese audience. We’ll be passing this onto our international sales agent CatnDocs. It was a complicated and difficult experience, but one that I very much am delighted to have had the chance to have. One indeed, that I will never forget. 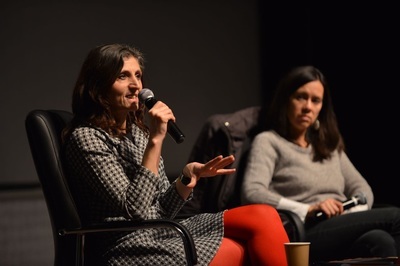 I then enjoyed several more days of films and masterclasses from the other filmmakers. I’d like to say an enormous thank you to Cherelle, Lulu and Candice and everyone at i Docs for inviting us. It was wonderful to meet them and all the other filmmakers from around the world. What an incredible experience China has been and I’m thrilled that so many people came to see Still Loved there. 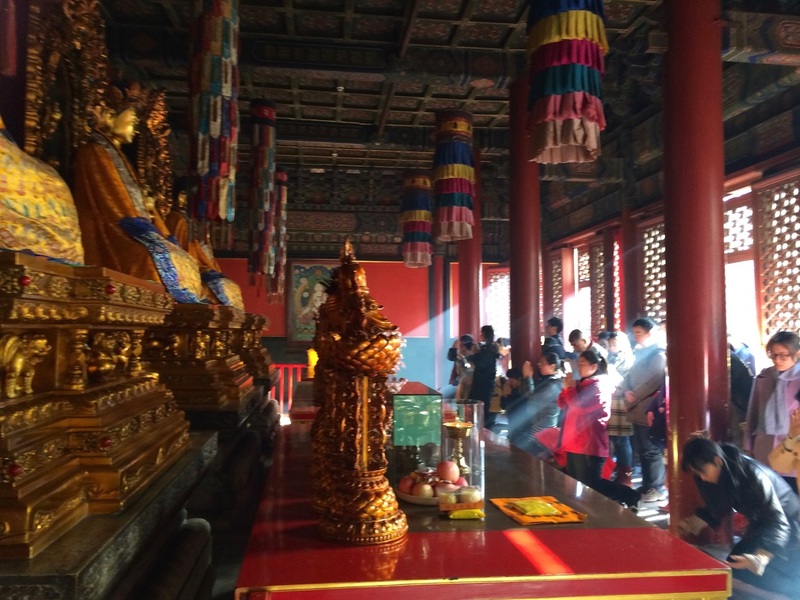 Once the festival ended I stayed on for a few more days getting the most out of my opportunity to be in China. 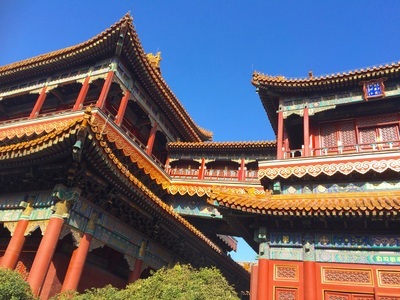 I packed in as much as I could visiting the Summer Palace, the Forbidden City, Houhai Lakes, Tiananmen Square, The Lama Temple and exploring the hotongs and markets. 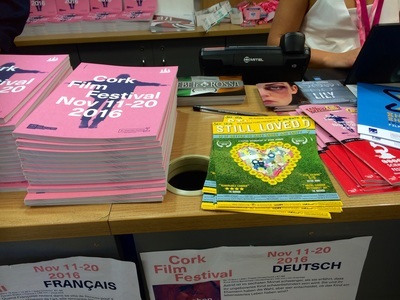 ​We were delighted to be invited to screen Still Loved at Cork International Film Festival Ireland in November 2016. Both myself and Producer Colin Pons attended. This was our first official film festival screening so it was an exciting event for us. We also were invited to screen at i Docs in Beijing and unfortunately both events were at the same time, so rather than miss either of them, we jiggled some dates around and the wonderful festival Director at Cork, James Mulligan, helpfully agreed to screen Still Loved right at the beginning of Cork Film Festival, so that we could screen on the Saturday 12th November and then leave for China on the Sunday morning. What a fantastic city Cork is. We were greeted by our driver at the airport on Friday night and taken to the lovely Ambassador Hotel. On Saturday morning we quickly ran around putting up posters and flyers for the screening and promoting the film. 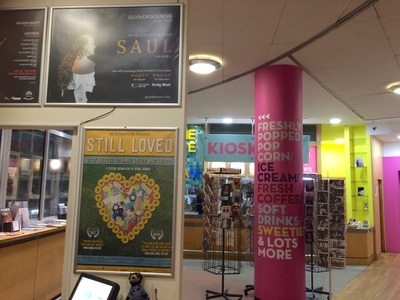 We screened Still Loved at The Gate Cinema at 6.30pm on Saturday evening. The audience were fantastic and James Mulligan led a great Q&A afterwards. We were joined by Mairie Cregan from Feileacain, the Irish baby loss support charity. We got some wonderful feedback from the audience. From this screening we got invited to attend the International Stillbirth Alliance Conference next year in Cork, which we are very much looking forward to. ​After the screening we went out to dinner with James Mulligan who told us how powerful he had found the film. He said that it was the second film he programmed for the festival, and knew instantly on watching it that he wanted to include it in his program. Regrettably we had to leave beautiful Cork and the rest of a fantastic festival very early Sunday morning. We were honoured and delighted to be included in the festival and huge thanks to James for programming us and helping to bring Still Loved to an international audience. I’ve just completed the Still Loved Tour and I’m writing this blog to let you know my thoughts and how it all went and give some useful tips and advice to independent filmmakers out there who are self distributing their own films. We have an international Sales Agent, CatnDocs, but we split rights with them right at the beginning so we could do the UK ourselves. So this relates to our UK release only.Throughout the making of this film we’ve been told there is no audience. No one will want to watch this film. I always knew that was wrong, but the tour has proved that, which makes me very happy. As this is the first time I have released a feature length documentary, I learned a huge amount along the way. Firstly, how important it is to have a budget for your release. Because we struggled financially to complete Still Loved we had completely run out of money for this part of the process. So make sure you budget for your release. Luckily, we were given a grant of £10,000 from a very helpful charity called the Jessica Mathers Trust, due to the subject matter of the film. Without this, we couldn’t have done this, so my thanks goes out to them. £10,000 may seem a lot, but there is so much to pay for to get a film out there. Firstly, we hired a booker, Martin Myers of Miracle Communications, who we met when we attended the incredibly useful Distribution Rewired at Edinburgh Film Festival in June. Distribution Rewired is all about self distribution and new ways of doing this. Ran by the wonderful Beatrice Neumann. I would highly recommend attending for great ideas and advice. Martin is very experienced at booking films into cinemas and has great contacts. He watched Still Loved and really liked the film so agreed to come on board and help us get the film into cinemas. Next we hired a team of publicists to use their skills and expertise to help us get some good press for the film. We worked with Multitude Media. I had met Will Wood at Distribution Rewired the year before and he had expressed an interest in the film, so I got back in touch and he agreed to come on board to help us. We worked with his team, mainly Emily Brazee, and also Amy Melson and Lucy Miller too. It was vital to us to release the film in October, during baby loss awareness month, with an emphasis on the 15th October, International Pregnancy and Infant Loss Awareness Day. We knew this would give us maximum opportunities for press and publicity. The wonderful Tommy’s Baby Charity also offered their help and supporting during the release of the film, and we worked with Hannah Blake and Siobhan Gray who did so much to help us spread the word. Multitude Media, Martin Myers, Hannah and I all met together in London in September to discuss a strategy and who would do what. I told them all I knew and linked them up to all the baby loss support groups and we all shared our contacts, knowledge and expertise to maximise our efforts in making as big a splash as we could with the film. After the meeting Tommy’s shared lot’s of information about the film in their news letters and I wrote some blogs for them. Multitude prepared their press release and started to send this out to various newspapers, magazines, radio shows and television companies. Martin got to work on booking us into cinemas and I did all I can to contact everyone I could think of to help us. Things were slow to start. 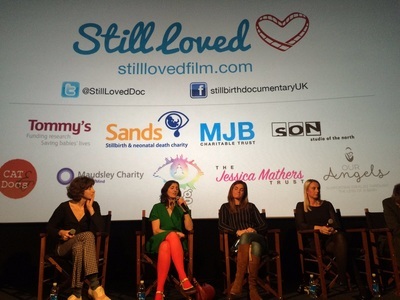 Over the next few weeks we had an incredibly disappointing response from cinemas, who, as usual with this subject matter of stillbirth, shied away from screening Still Loved. Some sent a one line email saying things like: “There is no interest in this subject matter” which really annoyed me. I wrote a lot of emails back telling them why they were wrong. This changed things with some cinemas, but not others. Unfortunately, only 5 cinemas were brave enough to book the film directly. There were a couple of others that were interested but couldn’t program us until next year. We wanted to strike while we had our publicists on board so needed to make sure as many of them were in October as possible. The cinemas that booked us directly were Sheffield Showroom, Nottingham Broadway, London Picturehouse Central, Belfast Queen’s Theatre and Derby Quad. Big thanks to all of those cinemas for being brave enough to take a risk on the film. Another company I had met at Distribution Rewired were Ourscreen. This was an interesting new model where you book the cinema directly through them, and you have to sell a certain amount of tickets before a deadline. If you don’t sell them the screening gets cancelled. If you do sell them, it gets confirmed and goes ahead. We decided to book a lot of screenings through them as 5 cinemas weren’t enough for our tour. Working with Ourscreen was difficult at first, because no one really wants to buy a cinema ticket 4 or 6 weeks before a screening and trying to convince people was very difficult, so I wasn’t sure at first this was going to work. Some of the cinemas only needed you to sell around 25 – 30 tickets. Others were much higher and one, Cardiff Vue required 97 tickets to be sold in advance, a crazy amount! So I pretty much lived on social media for the next few weeks, tweeting, facebooking, contacting as many useful organisations as possible to let them know about the screenings. Let me tell you one thing about Ourscreen: If you just book a cinema and leave it at that, nothing will happen. It will be cancelled. Expect to do an enormous amount of work promoting the screenings. For anyone that’s ran a successful crowdfunding campaign, it’s similar and as much hard work. During this time we had a massive problem with the DCP (Digital Cinema Print) not being formatted properly and we had to keep having it remade to the right format for various cinemas. This swallowed up a big chunk of the budget that we were hoping to keep to be able to cover the 6 weeks I had to take off paid work to do the tour. The money was disappearing fast. 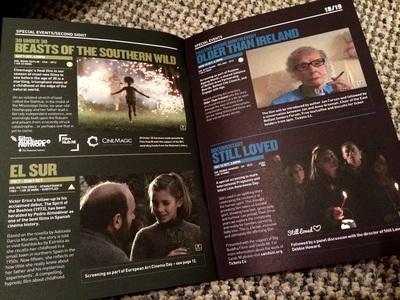 We also had to get the film classified at BBfc which again, which again is very expensive. You also have to have it classified for DVD and VOD as well. Note that if you can work with a charity and go through them, you can get a much lower rate. Tommy’s very kindly let us do this through them which saved us quite a chunk of money. So depending on the subject of your film, this could be an option for you. We then had to re design the poster and flyers and get those printed. The budget was dwindling fast. We started to see some success with Ourscreen and many of the screenings started to get confirmed, which was fantastic. Multitude Media were working wonders with press by this point and we had started to get some fantastic national press and reviews, and some local press to for individual screenings. All of a sudden, after a terrible start, things started to go crazy! 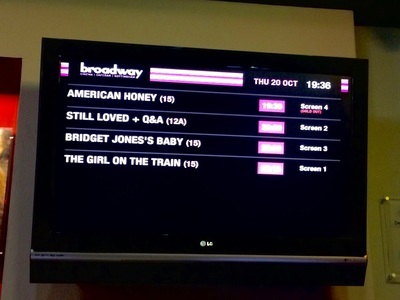 The tour started and our World Premiere was at AMC Cinema in Manchester. The next few weeks were a whirlwind of dashing up and down the country, doing press interviews, radio shows and screenings followed by Q&A’s. We redesigned the poster once some of the reviews came in. I was delighted that we got a four star review in the Guardian and many other highly acclaimed reviews and articles in the Observer, Little White Lies, The Lancet, The Mirror and others. You can read these on our website if you look through our previous blogs, they are all listed. “There is no interest in the subject”. Those words kept ringing in my ears. I’m delighted to say that we totally proved those programmers wrong. We sold out at many of our screenings and often had to be moved to bigger screens to accommodate the audience. The ones that weren’t sold out were extremely well attended. We even managed to pull off Cardiff, with the 97 pre sold tickets, which was fantastic. Ourscreen works incredibly well for a film of this kind, where you know there is an audience, but the gatekeepers won’t let you in. As long as you’re prepared to put the work in, it’s a great way to get your film into cinemas. At every screening we had a Q&A afterwards. This was enormously important I felt. We always had an panel consisting of either one or more of the parents from the film, or a bereaved parent from the local area, baby loss befrienders or support workers from Tommy’s, Sands or Our Angels, or a bereavement midwife, sometimes senior consultants like Alexander Heazell from Tommy’s, myselt and sometimes our Producers Polly Perkins or Colin Pons. We had different Chair people leading the discussion at each screening. This led to some very interesting questions and discussion after the film and some of the Q&A’s went on for up to an hour. We found that our audience was made up of many people that had been affected by the loss of a baby either directly, or someone close to them. Whilst we had expected this, we hadn’t anticipated how many of them found the film to be incredibly positive and we had some wonderful comments, especially from the recently bereaved as to how the film had helped them to feel normal again and see that there is hope for the future. What we hadn’t expected was the great quantity of midwives, student midwives, doctors and other health care professionals that came along, and how exceptionally useful they found the film. We also had funeral directors and bereavement councillors, as well as filmmakers and members of the general public. 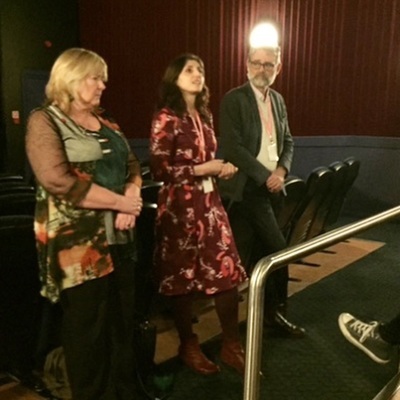 It was fantastic to hear the feedback from health care professionals as to how helpful the film had been and how it would inform their practice in the future. This couldn’t be better news as they are the ones on the front line, and this could potentially help to save babies lives in the future. During the tour we had completely run out of money so didn’t have enough to even cover my time, as I had to take several weeks off any other kind of work to do the tour. We kept a Just Giving campaign running throughout the tour where people could donate on line and at the end of each screening we put a pot out for donations from the audience and people were generous. This covered my travel and food etc, which was very helpful. It wasn’t good to have to do this, but we didn’t have much choice. This is low budget filmmaking indeed!We are now getting enormous demand for the film to be used for training purposes and getting requests for additional screenings in universities and support services. We got an incredible two page review in The Lancet the bible for health care professionals, so this is wonderful. As the tour drew to an end other cinemas started to contact us to book screenings for next year which is great and other people started to create their own screenings on Ourscreen. Not all of these have come off, due to the hard work it takes to do this, but some of these have already been confirmed. 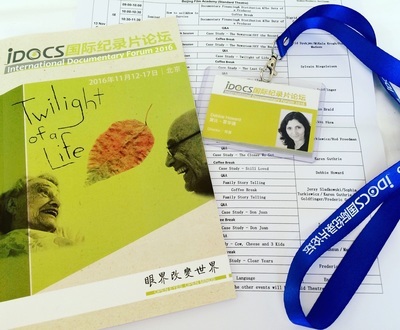 At the end of the tour we screened at our first two film festivals, Cork Film Festival in Ireland and iDocs in Beijing China where we screened to over 1000 people! These were incredible experiences in their own right and you can read the blogs on links above. We’ll be writing to TV commissioners again and sending them facts and figures as well as reviews now the tour is over. We’re working hard to make the film available to health care professionals and others as widely as we can next year but need to raise more funding to enable us to do this. We also want to subtitle the film into several languages to make available in other countries. I hope some of this information might be useful for anyone self distributing for the first time. Good luck! Written by Director/Producer Debbie Howard.